One of my biggest pet peeves is working with wedding videographers that treat their craft like it’s photography. In doing that, a lot of talented people sell their art form, and the art form of their peers, short. So what can you do to focus your videography and cinematography skills and make your wedding videos more refined? Think like a filmmaker. I’m positive you’ve read a lot of great literature telling you how photography can help your videography. This is undeniably true. Focusing on the way you compose images and developing your style should never be undermined. 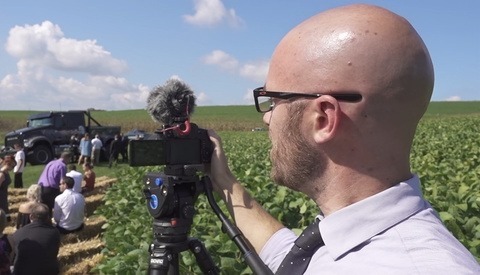 But, I can’t tell you how many times I’ve had some really talented photographers tell me they’re also a videographer (when their work doesn’t quite merit that). The inverse is also true. I’ve had so many amazing videographers tell me that they’re photographers when it clearly isn’t so. Why do these visually talented people have work in their non-dominant field that isn’t quite… great? It all comes down to the way you think about your work and how well you can refocus yourself to accommodate each medium. Changing the way that you approach a shoot, depending on the medium will absolutely be a great first step to giving your work the proper respect, and thought, it deserves. 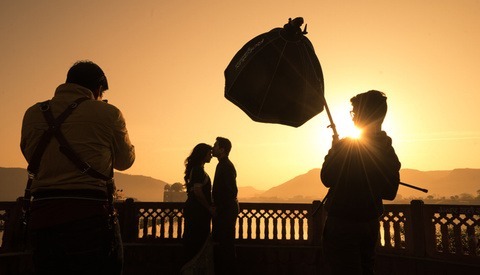 Wedding filmmaking is so vastly different from other types of video and film shoots that it’s sometimes very difficult to find parallels that are helpful. So before you even step on-site take a moment and really consider what you’re bringing, and how you’re going to create visual consistency. It runs counter to what you might believe, huh? The idea of limiting yourself to a couple focal lengths might scare a lot of you, but you’d be surprised how much power it places directly in your hands. And this isn’t an original idea. Filmmakers across generations have found a lot of peace, and power from focusing their films through the glass of a single, or two focal lengths. Steven Spielberg, Wes Anderson, Alfred Hitchcock—All men that are respected not just in their story-telling, but also in the ways that their stories are displayed via their imagery. In limiting themselves (most of the time) to certain focal lengths, they create visual consistency and a brand. Each of these filmmakers is also a master of blocking action in and out of a scene. Now don’t get me wrong. These filmmakers have, across their filmography, used a wide variety of focal lengths. But the point is that their work uses unorthodox lens choice as punctuation on a sequence instead of using a different focal length for each scene. You should be thinking this way too! Instead of changing your lens to accommodate a space, use your lens consistently over time, internalize its field of view, and then you can much more easily pre-visualize angles, depth of field, and motion. This makes you a much more efficient and consistent shooter. It also adds a subconscious watermark in the eyes of your viewer if you do it for long enough. Personally, I shoot almost exclusively 35mm and 85mm. At this point, I never walk into a room and think about my focal length. I’m instantly thinking about composition and lighting. That’s what limitations do for you—they focus you on what’s important. 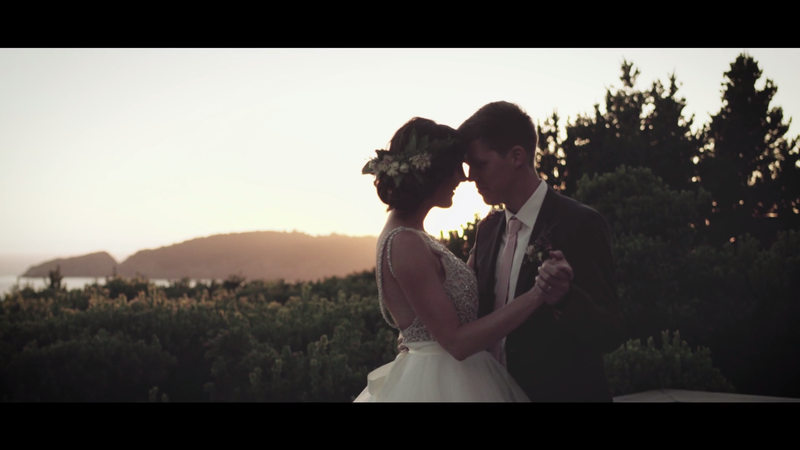 I so very rarely edit other people’s wedding footage these days, but when I do I often notice one huge ethic that’s almost non-existent on most wedding shooters. Shooting in sequences. There’s a real, powerful tendency among wedding shooters to be highlight shooters. That is, instead of really considering the story of the day, or how things will cut together, we shoot disjointed, but blanket coverage of an entire day. This really removes the audience from the story and puts a lot of pressure on your editor to create that ebb and flow at the pace that everyone loves. Filmmakers have the luxury of pre-planning scenes and shots to get in and out of scenes, but just because they can plan, doesn’t mean you can’t emulate that technique with on-site improvisation. When I have people (that I trust) second shooting for me, I VERY rarely tell them the important details that they need to get. If they’ve shot enough weddings, they already know exactly what details are important. What they usually don’t inherently know is that I’m looking for shots that get us in and out of a scene. It’s easy to imagine this as just a slide from behind a table or a glidecam shot of someone getting into a car, but think about the action of each scene. What works as punctuation on an action? A detail, like a necklace, and then hands reach into the frame and pick them up, the action of putting it on and a wide slide, getting out of a scene. Not the greatest example, but try and visualize how you get into a scene, and an action, instead of just capturing the day as separate details that comprise a whole. Often, this isn’t just a visual exercise though. Using audio is a huge part of feeling part of a scene, and that leads me to my final tip. One of the best ways to create a video that’s not engaging for a client is to never use audio. The simple method of including audio is during the ceremony and speeches, but that shouldn’t be where you stop. Just as a filmmaker sets the tone of each scene with the audio of the surrounding setting, you should use audio to create the best landscape for your wedding clients. Using on-site audio helps you add a lot of texture to your videos, it allows your clients to remember all of those emotions, but in just another way. Capturing the funny laugh of a friend, the off-handed comment and a reaction—these things are just as important, and probably more important than shots of applying makeup. So why do many videos not feature audio? It’s so easy to look around at your fellow wedding videographers to see what works and what doesn’t—and we should all continue to do that. But for you to really excel, you should look at all of the different types of visual storytellers and learn from them. The same way that we are trying to tell the stories of our clients, film directors are trying to tell the stories of their characters. Use those techniques and your stories will become more focused, and the shooting will be that much more efficient. When the wealth of information and experience runs so deep, there’s no use in discounting technique just because our content doesn’t have the same reach or specific content—and in the end, you’ll see that we share more goals than you may have initially thought. 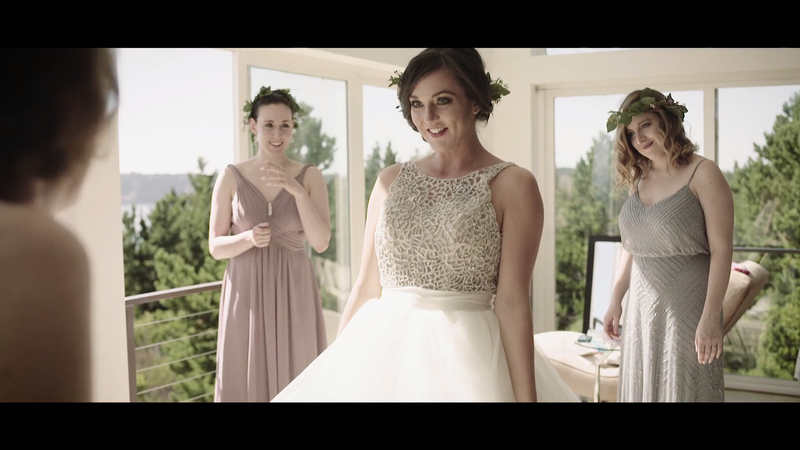 All stills from my wedding video for Joe and Allison Camden filmed in Port Orford, Oregon. Full video here.